The aim of the Jailbreak event is to get as far away as possible from the designated start point within 24 hours. The event will start at 8am on Saturday 13th July 2019 and will conclude at 8am on Sunday 14th July 2019. The event is open to over 18s only, comprising of teams of 3 people. There is an entrance fee of £15 per team. The event is sports themed – costumes for participants are essential! Most prisoners will be released back into our communities in the future; it is critical that they are rehabilitated whilst in custody to prevent the risk of reoffending which leads to increased numbers of victims of crime. The Friends of Erlestoke Prison supports projects which are beyond the scope of prison budgets but which are proven to positively contribute to rehabilitation. As well as fundraising for our ongoing projects, we are also raising money to build an all weather sports pitch in the prison grounds to benefit prisoners and staff. The recent ‘A Sporting Chance’ independent review of sport in prisons recognises that sport can play a key role in the rehabilitation process. Professor Rose Meek, the report’s author says “participation can not only improve mental health and behaviour, but can directly contribute to efforts to reduce reoffending, particularly by providing a route in education and employment”. The report has been endorsed by the Government who recommended that prisons should devise an ‘integrated physical activity and wellbeing strategy’. • Provide opportunities to strengthen relationships between prisoners and their children on family days. • Enable the prison to offer sport/lifestyle qualifications to help prisoners obtain employment on release. So far over £120k has been generated by other fundraising events, or pledged for this exciting project. Money raised from your Jailbreak will contribute to our existing projects and the sports pitch fund. You must have submitted your signed Registration Form and Disclaimer Form to info@friendsoferlestokeprison.com or by post to: The Friends of Erlestoke Prison, HMP Erlestoke, Westbury Road, Devizes, Wiltshire SN10 5TU by Friday 5th July 2019. You must be at the designated start point at 7.30am with all of your teammates, kit and instructions ready to start the Jailbreak at 8am Saturday 13th July 2019. Get as far away from the start point as possible within 24 hours. Theme – sports fancy dress is essential. Only £10 per person spending money allowed (your own money). Each team is responsible for fundraising and collecting their sponsorship money. Each team member must be physically able to take part in the event. Research – find out all you can about Jailbreak and the Friends of Erlestoke Prison. Know what kind of projects and programmes that we support and why you are raising money for us. Fundraise – get your sponsorship sorted. The more you can say you have raised, the more generous people you meet on your journey will be. Please fundraise online through Justgiving. You will find our Jailbreak event on their site. Call in favours – don’t make too many plans for your journey as you never know what will happen, however call in favours with family and friends for pick-ups and drop offs if they can help. If you rely on this too much though, you won’t gather money during your journey, or help to promote the charity to people you meet. You cannot use your own vehicle and drive yourself as far away as you can…that defeats the object! Think about how to get home – this may be something that you need to think about more during your journey, but remember that it’s your responsibility to get yourself home, so the further you go the more you may need to think about how you get back and if it will cost you money. Smile – never forget that you are trying to charm your way to be as far away from the start line as possible. Strangers are lovely – of course there is ‘stranger danger’ but talk to as many people as you can on your journey. Say yes – stay safe, but the more you say yes to offers that people make to help you, the further you will go and the more you will raise. Never give up – 24 hours is a lot of minutes…1,440 to be exact, and a lot can change in that time. Enthusiasm will get you far! Remember the return journey – you might have travelled hundreds of miles, but you still need to get home in time for work on Monday! Stay social – tweet about your journey on the way using the hashtag #charityjailbreak and tag the charity @friendserlepris in your tweets. By tweeting you’ll raise the profile and social media and you never know who might read the tweet and offer to help you out. Fancy dress – sporting theme. Warm jacket with layers underneath – you never know when you might end up too hot or too cold. Big bag to put sponsorship money in – you’ll be trying to fundraise as you go. Snacks – something to keep you going…sleep is overrated but 24 hours is longer than it sounds. Water – you need to keep hydrated. Torch – some of your journey will be in the dark. Sensible shoes – walking boots or good trainers. Tent/sleeping bag - a consideration depending on what your plan is! Mobile phones and chargers - to help keep you safe and snap photos along the way to prove where you’ve been! £10 per person – this is your own money to help get your journey underway from the start line. 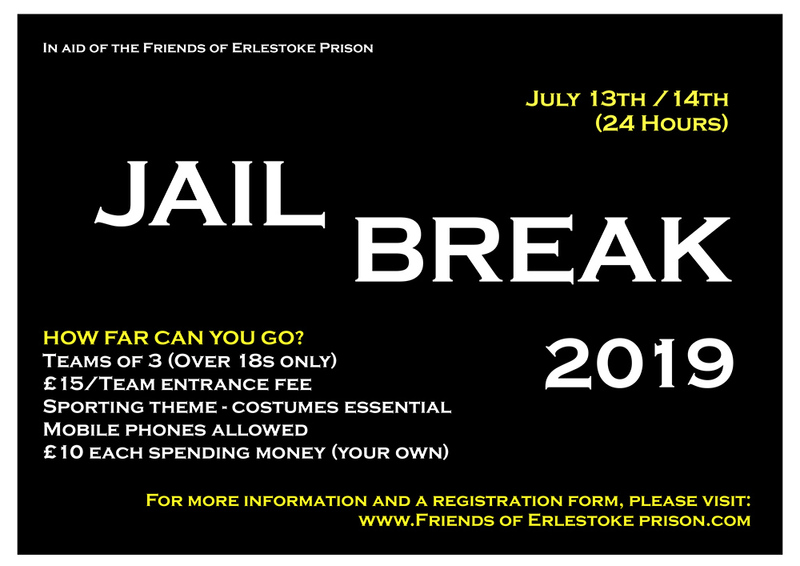 To take part please download and complete the Registration and Disclaimer forms below and email them (photographs of the signed forms are acceptable) to info@friendsoferlestokeprison.com. Please submit your Registration and Disclaimers forms by Friday 5th July 2019.